My parents and I have always been close. I have been blessed to live near them and watch them become amazing grandparents from the day NHL was born. My father has patience at times with the boys that I never knew existed. 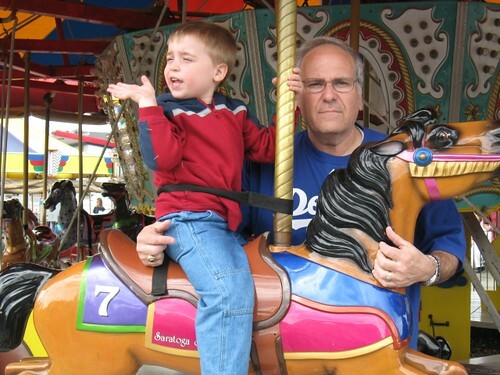 He loves to play with them, and especially take them on amusement park rides. In July 2004 we started a tradition with Papa and NHL. They go to a local amusement park and get their photo taken together on the Merry-go-round. This year we went back again for our fifth photo. Today my father turns the big 60! We will celebrate with them for cake tonight and then this weekend a family party at the lake in his honor. Dad, thanks for being you and never complaining when we call in the middle of the night, or running over in an emergency. You have taught NHL important lessons, like playing Snood, "Yankees Stink," and how to sing Elvis and Neil Diamond. We love you and even your crazy LA Dodger ways! Happy Birthday to a great Uncle too…your dad has been such a great part of my life and I am so thankful for the times I spent with your family growing up. Have a wonderful time tonight and enjoy the lake this weekend. What a great tradition! Those will be priceless pictures. I’ll bet it is so fun to compare the changes over the years. I hope your Dad has a fantastic birthday! No matter how old we get, our parents will always be our parents. Happy Birthday to your Dad! I finished Breaking Dawn. My goodness…..